While it is not necessarily a poorly known fact, the “static pressure cheat” (SPC) is something that we should all remind ourselves of whenever considering the specifications of a fan’s performance. The essential point to remember is that total pressure (Pt) is the measure to use in evaluating performance, not only static pressure (Ps). In some cases, when an end user desires a fan for a specific purpose, they will understand that the fan they need has to have a certain static pressure delivery. The thing to note about static pressure is that it is dependent on the cross-sectional area of the plane of measure. That is to say that the duct size matters. If we are comparing two points in a duct system that have the same area, there is no problem, however, fans have varying areas in terms of inlet and outlet flanges, which are the points at which mechanical performance is rated. In the calculation of fan efficiency, we need to account for the total energy contributed to the gas (air stream) by the fan. This means that we cannot use only part of the pressure equation above, but must rely on the complete pressure rise, or we have missed part of the whole picture. Velocity pressure (Pv) is related to the velocity in the duct, so for a given volumetric flow rate, the Pv will change according to the size of ductwork the gas must flow through. In the above equation for Pt, we can see that it is the sum of Pv and Ps that make up Pt. So if losses are small, we can assume that as a gas volume flows through a duct, it’s energy state will convert between Ps and Pv to arrive at the same sum, Pt. And here is where the “cheat” comes in. If a fan’s performance is specified in terms of Ps, the fan designer can simply use a large diffuser at the outlet of the fan to bump up the static pressure. That is, if we increase the cross-sectional area of the point of measure, we decrease the velocity, and increase the static pressure, making the fan look like it is delivering a higher performance. To avoid this, fan performance should be expressed in terms of total pressure rise, and thus capture the complete energy developed by the fan when including flow rate. This will enable the correct evaluation of fan efficiency and, for comparative purposes, negate the effects of differences between the cross-sectional areas of the points of measure. Different fans with different inlet and outlet areas can now be compared and contrasted on an equal basis. All the best in your fan specification developments! If you would care to discuss this article or any details mentioned above, please contact Trevor Preis. As costs continue to increase for operations, maintenance, and equipment replacement, the importance of efficiency in industrial processes cannot be overstated. The cost per unit of production continues to be the measure of decision makers to assess their best capital investment opportunities in maximizing returns. In this blog, we’ll also explore why fans may not be operating at peak efficiency. It is with this in mind that we turn to the analysis of fan efficiency; its calculation, sources of error, and ultimately its use as a parameter for making decisions. We use the term “total fan efficiency” to differentiate our parameter from the pseudo-efficiency values of “static fan efficiency” and “fan static efficiency”. Of these terms, only total fan efficiency accounts for the total mechanical energy that the fan imparts to the gas stream. Frequently fan curves will be published based on laboratory testing under ideal conditions (e.g. low pressure, fully developed flow). However, it is rarely the case that ideal conditions are found in the field. We employ field testing to account for conditions on site, including system characteristics that directly affect the efficiency of a given fan. Note that the total efficiency in the above equation takes into account the compressibility of the gas under the conditions of actual fan operation, which can affect the calculated efficiency value by up to 10%. When evaluating your fan, the fan curve can be a useful tool to understand why the efficiency may be low at the given operating point. 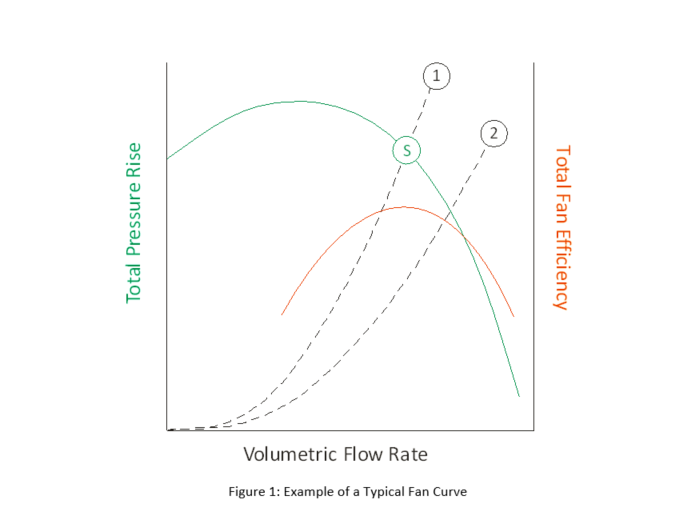 Figure 1 shows a typical fan curve (green) with two numerated system lines (dashed), and the rated efficiency curve. The “S” denotes the selection point for the desired performance. In this example, the fan design was developed for system line 1, while testing reveals that the actual system resistance curve is represented by line 2. The selection point is at the peak efficiency of the design, however, under normal operating conditions, the fan efficiency is approximately 10-20% lower than design. When deciding on a fan upgrade to improve efficiency, performance, or wear life, we design the impeller to the actual system and system characteristics to maximize these benefits and will restore or exceed the original design fan efficiency.